Shown as a short season of films – in the lead up to the Royal Wedding – to promote the Korean island of Jeju. Ironically, this night was the evening where it had finally dawned on me or hit home that I should have possibly taken an 11 day holiday….by just using 3 of my work holiday days. Actually, I already knew that I had the option but due to the indecisiveness of my nature, and the fact that I’d not planned much nothing went ahead. I even briefly considered Korea as a destination this time around. Oh well, at least it will be money saved, for now. So. I found myself indoors on a lovely (hot…yes, in the UK!) evening, at the Korean Cultural Centre, London…again. Except, it wasn’t as dramatic start as I make out. It was a very mellow beginning to a film which ultimately felt like it had been made by the Jeju Tourist Board*. Jeju being Korean’s much loved little island and also the reason for this film tonight. 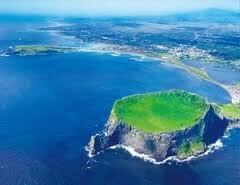 You see, Jeju has been nominated as one of the new “Seven Wonders Of The World”. Including various museums from this exotic island – one or two dedicated to well-known historical figures and … yes … Teddy Bears! (sweet though). A very different film to the previous week’s offering at the KCC but interesting in other ways, even if at times it did feel like it was filmed by the same people who make soap operas – perhaps Korean ones, but I kept envisioning Australian ones, for my sins. [Asia-wise, I’ve witnessed Thai, Vietnamese and Philipino, Chinese & India ones – or at least snippets of, on one’s travels]. I’m not, as you may know, one for giving away entire plots – but I will say that this movie is split into 3. 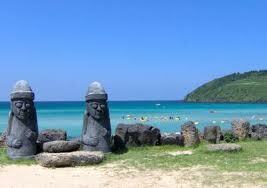 Then we have a woman who is visiting Jeju and searching for her true self. The film has comedy, lovely music (mostly…and the kind I’ve come to expect from so many Korean films), good characters & actors and of course, exquisite shots of Jeju’s scenery. There’s little else to say, except JeJu looks like a place for J(e)V(ee). Review by JV (aka MM). “The Trip” Tweview: Quaint, Quiet & Quintessentially Korean. 3 stories of Finding Love, Finding Family & Finding Yourself .